To start things off, I used to wear braces for about two years and I think at that time I was 12? Now, I'm 25. In between now and then I tried whitening strips like once, and toothpaste that had baking soda, or whitening toothpastes but the results were subpar. Also, I have been a big coffee and tea drinker. Recently, I've been a big matcha drinker! So I'm sure those have stained my teeth to some degree. Also, I do love a glass of red wine here and there and can add some staining. So, something that I actually enjoyed during this process was making the whitening trays! You get to mix the "putty" basically, and you get to mold your own teeth. I was worried I'd mess up but an extra set is included just in case. But, you can also call them if you need more than that haha! It took about a few days to get the trays back after I sent them in (no extra shipping charge and the envelope was already included). When I first was going to try it out, I was worried about sensitivity. So I put coconut oil on my gums and I think that was really the only time I did that. Every session after, I didn't need to use anything for sensitivity. I did notice some decalcification - which was explained to me by their product expert was: "Decalcification--that de-mineralization of the teeth caused by whitening. As the gel carries stains out, it takes with it minerals and hydration. Over night, your saliva is re-mineralizing your teeth and making the streaks disappear. You can take a break from whitening for a few days and just use desensitizing gel. 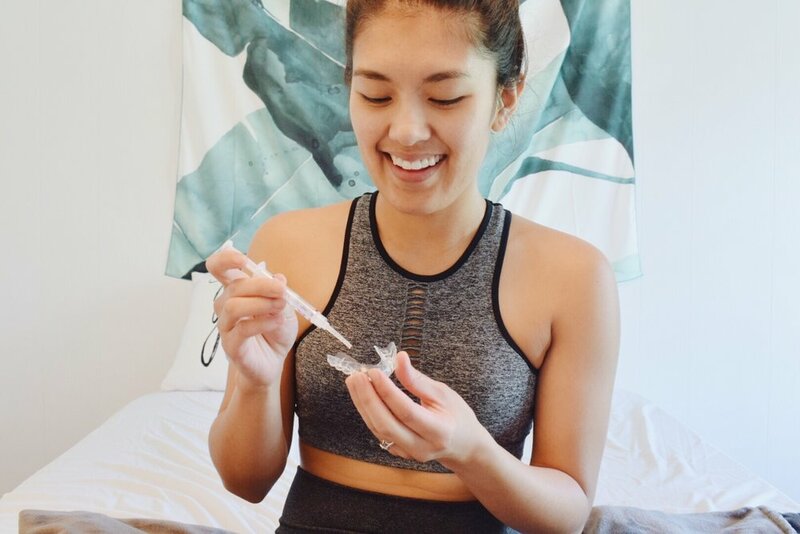 Just use 1/6 of a syringe of gel in your trays for 20 minutes per day without rinsing the gel or eating for another 20 minutes (it is best to do this right before bed). It must mix with your saliva to activate a proper barrier : ) Do that for a few days and it should help the white streaks and prepare your teeth for whitening." I included that little blurb because throughout this process they were so kind in helping me navigate and troubleshoot any problems with sensitivity, any questions I had such as "why do I have this decalcification? ", and how long I should keep the trays on. I started by doing 20 minutes each for the whitening gel and another 20 minutes for the desensitizing gel. I tried my best to do it at night time, but there were a few times I would do them while I was at home studying. This was actually a perfect way to still do some #selfcare while being productive haha! All in all, due to my busy schedule, I did about 7 sessions of whitening in a time frame of two and a half weeks. In my opinion, I got about 2 shades brighter than what I had before. And that's just with seven 20-minute sessions! 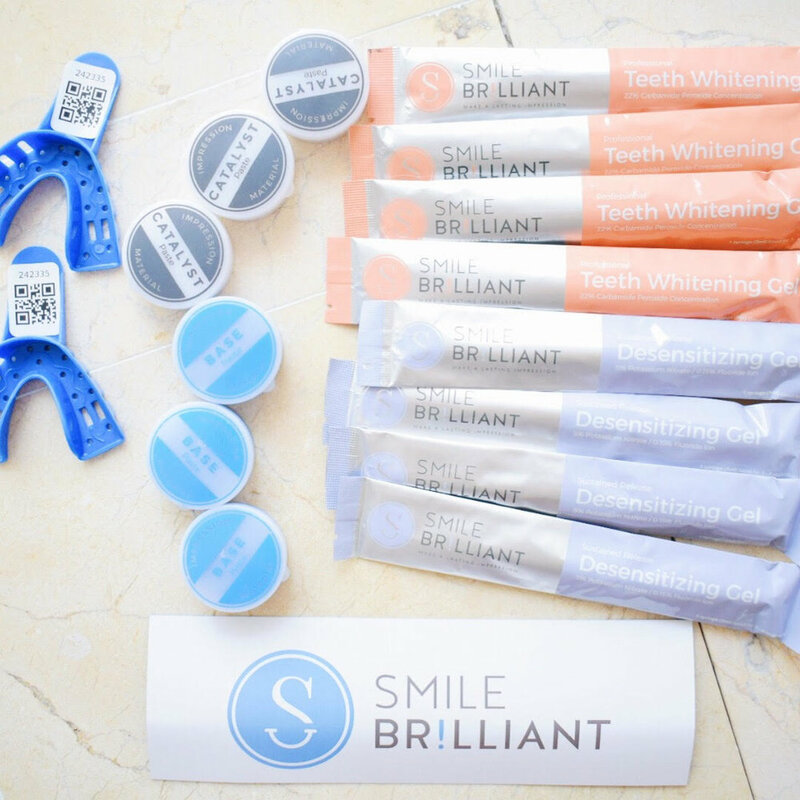 Using Smile Brilliant was very painless and straight forward. All the instructions were included to truly make it fool-proof! But, like I mentioned earlier you can always contact them for any help or questions you have during the process. I think if I truly cut out the teeth-staining drinks, I would have seen an even bigger difference, but ya'll I can't live without some kind of morning drink whether its tea, coffee, or matcha. Another thing I loved was that I can easily use it while I'm studying. Being a medical student, there's so many things on my plate and things like whitening my teeth usually takes the back-burner. I'm glad that I can easily incorporate Smile Brilliant into my busy life! Whether I do a quick 20 minute session, or a longer one, it's really up to me. Last but not least, I'm so excited that I can share with you all an opportunity to WIN YOUR OWN Smile Brilliant Teeth Whitening System! By heading to the link below (it's a specialized link for my blog specifically! ), you can enter for a chance to win one! Make sure to also follow along on my Instagram @_dorothyfaye for more information! *Contest will run for 1 week. Open to USA, UK, Australia, and Canadian residents. Giveaway winner will be selected randomly via e-mail, so make sure to enter your e-mail address! 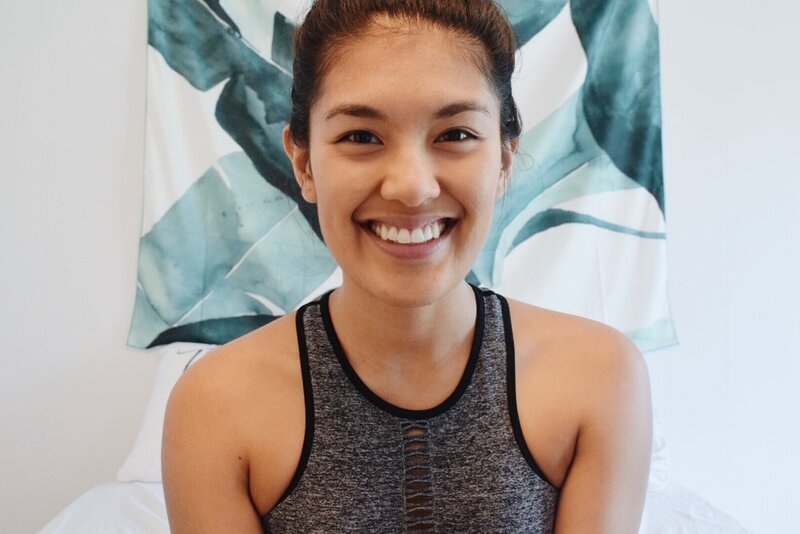 you can use the code: "LIFEINTHEMEDLANE20" at check out! I hope you enjoyed my story and my experience with Smile Brilliant, and please let me know if you're interested & if I can answer any questions for you!